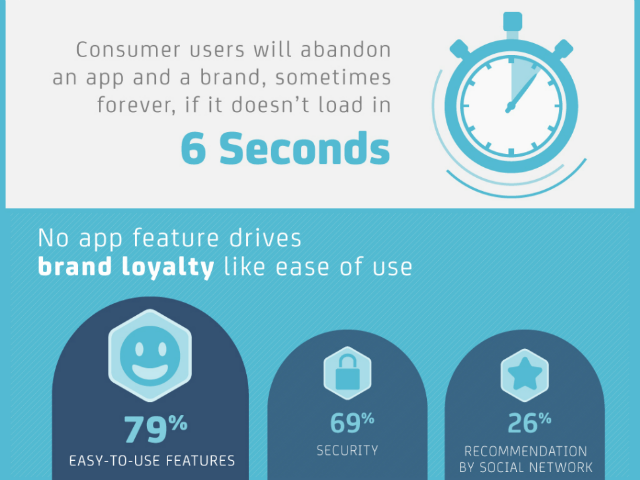 CA Technologies researched the biggest factors impacting consumer loyalty to apps and brands. Software company CA Technologies has released the results of its global study, measuring app loyalty between consumers and businesses. The study, Software: the New Battleground for Brand Loyalty, surveyed 6,770 consumers and 809 business decision makers in 18 countries, and discovered three major factors impacting the consumer loyalty to and use of mobile apps. The first is app loading time. The study showed 68 percent of consumer respondents, who have left a brand because of poor loading times, desire apps to load in six seconds or less. More than half of those respondents demand a load time of less than three seconds. If an app fails to load within that time, consumers are likely to abandon the app, or a brand altogether. The next is simple functionality. More than 70 percent of consumers ranked “perform tasks with little difficulty,” and almost 80 percent ranked applications that have “easy to use features” as the top factors when determining whether to purchase or use an app. Finally, consumers demand security, with 69 percent of respondents saying security drives their loyalty to an app. When a security issue occurs, 10 percent of users who have had a fair or poor experience in the past said they would leave a brand forever because of these security issues. Consumers no longer view applications as nice-to-have novelties. They now have a huge impact on customer loyalty. As businesses navigate a new, always-connected reality that produces vast amounts of ambient data, they must react by delivering a personalized, secure and engaging application experience. Elsewhere, the study highlighted consumers’ growing desire to use apps to perform important tasks. For instance, 60-70 percent of respondents said they would likely use an app to renew their driver’s license, pay their taxes, renew their passport or apply for other government licenses. The full study is available here, and you can check out an infographic highlighting the key figures below.